I’ll give you the Cole’s Notes version of the weekend, with the few pictures I have. That way, we can start anew for November. Sound good? I was up way earlier than I ever should have to be on a Saturday, so I could go help out with inventory at my sister’s work. 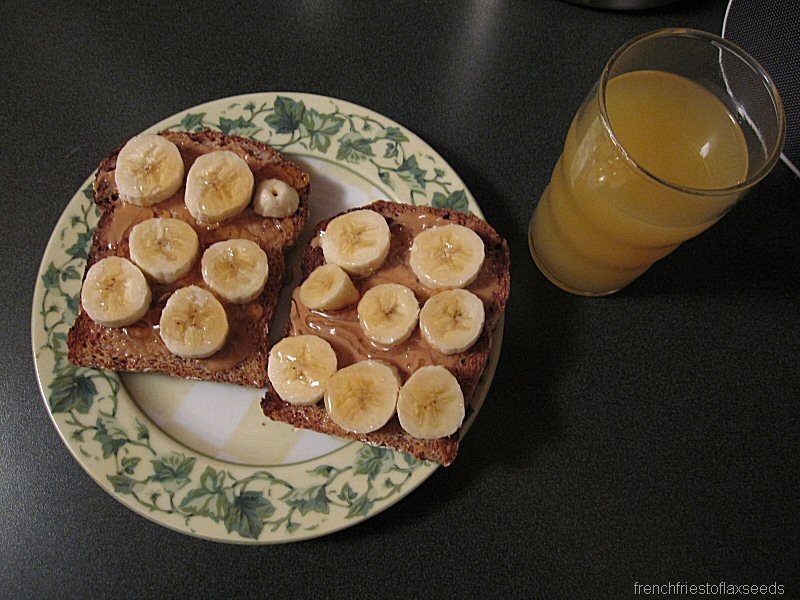 That meant I had little brain power available to make anything fancy for breakfast, so peanut butter, banana, and honey on toast it was. With a glass of Happy Planet Mango Peach Party, of course. Then there was a whole lotta working in the warehouse. Remind me, I never want to work in a dirty ol’ warehouse. Never. 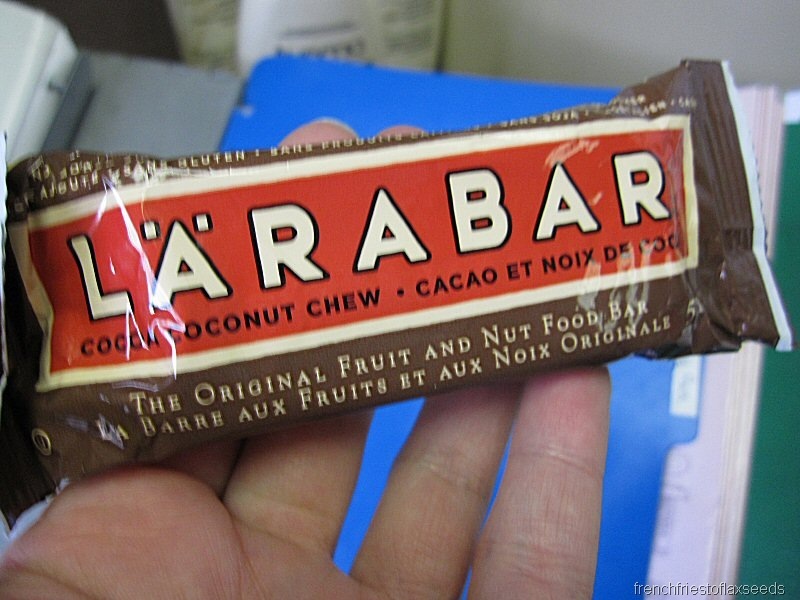 At first coffee break, I broke out this Cocoa Coconut Chew Larabar, and devoured half. Silly me, I thought that would keep me out of the Hallowe’en candy all day. Boy was I wrong! I definitely had my fair share of delicious bite-sized chocolate bar treats. 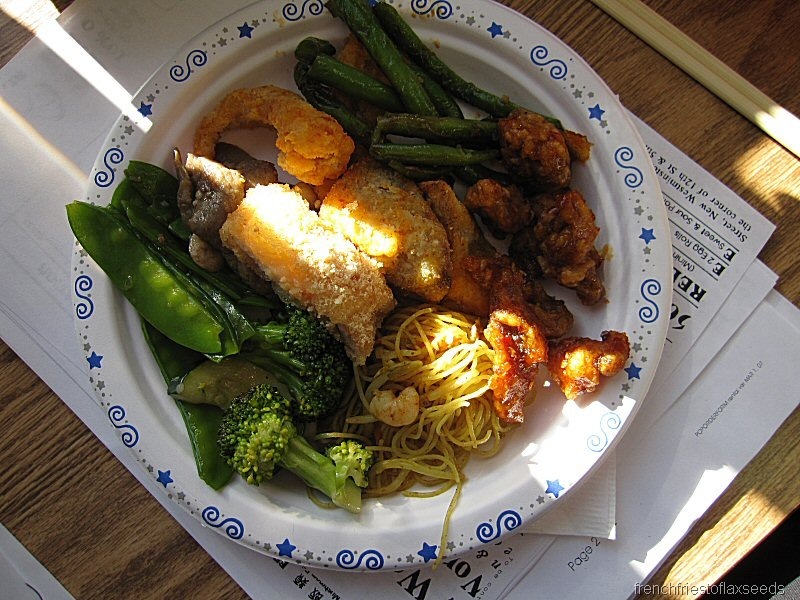 They ordered in lunch for us, which was Chinese food. Love! There were some interesting dishes I got to try. My two new favourites? Deep fried eggplant and deep fried squid with spicy salt. I could eat that and some veggies, and be a happy camper. Yum! More working, yadda, yadda. We actually got to leave early, and I informed my sister I was not going back on Monday to help out again. Lots of reasons, but frankly, it was driving me insane. Later on, I made my way over to my cousin’s house, and hung out with his wife all night. We ordered in delicious sushi, handed out candy to little trick or treaters, watched 3 movies, hit up the hot tub, consumed our weight in candy, and may have had some drinks. Good times! I stayed over, and was greeted with spectacular cinnamon raisin bread French toast for breakfast. I went home, wasted some time, then took a trip to Costco with my mom. Got a few excellent buys, came home, started Hallowe’en candy detox. HA! 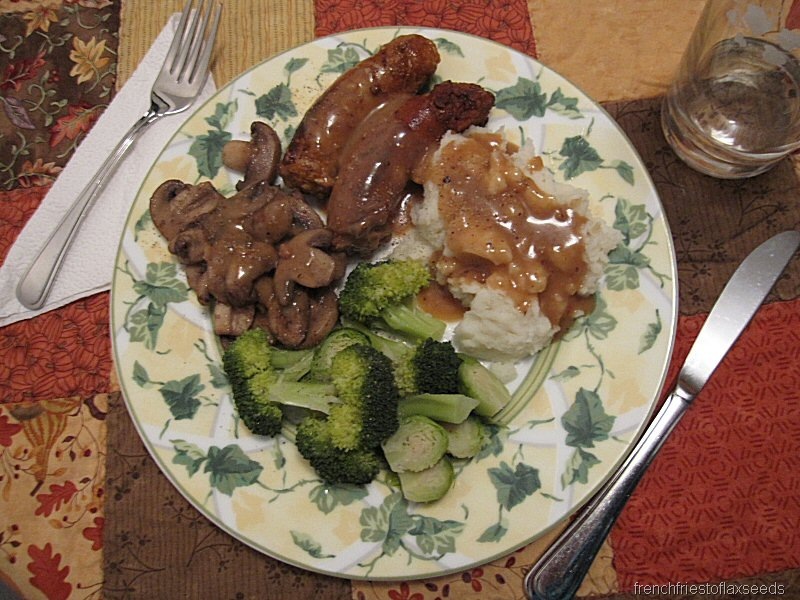 We had something for dinner I haven’t had in probably 5+ years – sausages & gravy. We picked up some hot Italian sausages at Costco, mashed potatoes, sauteed mushrooms, and steamed some broccoli & brussel sprouts for an excellent dinner. Mom can’t go to Costco and not pick up some sort of dessert. 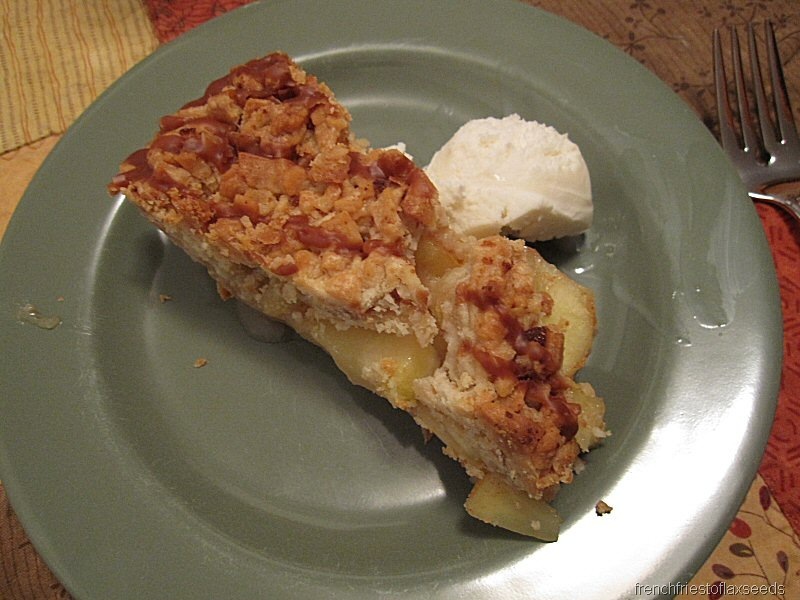 We got this gargantuan caramel apple crumble pie. Seriously, the thing weighed over 5 lbs! I had a sliver, with a scoop of vanilla fro-yo. Sunday night ended with some Amazing Race, and we started watching some of my Planet Earth DVD’s that I got for Christmas last year. Very cool – I just have to find the time to watch the rest now! Looks like a pretty good eating weekend!